On May 1st, couples gather at the statue of Karel Hynek Mácha, the Czech Romantic "poet of love", in Prague's Petřín Park where they lay flowers and spend a few moments. The park is a particularly romantic place in May when its cherry trees are in bloom. Since May 1st is a national holiday in the Czech Republic, lots of people come to Petřín for a stroll if the weather is nice. 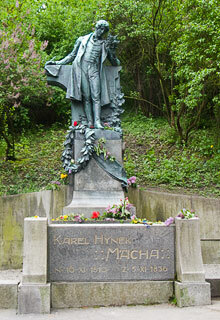 Karel Hynek Mácha (1810 - 1836) was a great Czech Romantic poet and author of the epic poem Máj (May). The poem, written in a remarkably beautiful style, tells about the tragic love of two young people and has become a poetic masterpiece of the Czech Romantic period and Czech literature in general.